Welcome to my Website. My name is Herb and I am 20 years old. 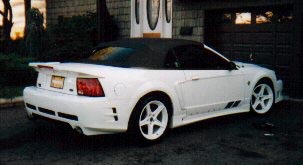 I live in New Joisey and I own 2 beautiful Saleen Mustangs. One is an 89 white Saleen Hatchback #550 and the other is a 99 white Saleen S281R Speedster #205. I included pictures and info of my cars and my friends' cars. Hope you enjoy the pictures and the site!!! The Saleen has a full Racecraft suspension, roots type supercharger, Borla exhaust, off road x-pipe(don't tell the EPA), 3.55 gears, 70mm t-body, Steeda shifter, MAC Cold Air Kit, GW lower control arms, Steeda upper control arms, Recaro leather seats, and other custom parts. It is a very sharp car and so far has got me down the 1/4 mile in 13.5 without the control arms, gears, T-body, MAC Cold Air Kit, and shifter. On the dyno this baby has produced 320HP @ the wheels(about 380BHP) and 360 rear wheel torque without those above mentioned mods. Hopefully next visit will get me over 350RWHP on the dyno and in the 12's on street tires at the track.